GotToLove♥: Battle of the Bright Dresses. For the third part of the trilogy I decided to show you some of my favourite bright/neon dresses. Out of these three trends I definitely think that this one is my favourite! Bright colours just make everybody so happy including me- and just feel genuinely great. So let's get started! 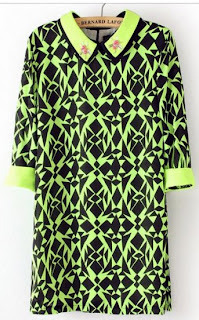 I thought I'd start of with my favourite dress -I think there is going to be a lot of controversy over this, but of some reason I just love it!- The neon green against the black geometric pattern just looks so cool. You could pair this with some simple black heels so you don't detract or over complicate the outfit. On the collar there is some embellishment, which I'm not really a fan of, but it looks like it could be easily taken off. Check this out at SheInside. This is such a beautiful yellow, and with the appliqué lace detail it just looks gorgeous! Ted Baker dresses are almost so lovely so I wasn't surprised to see this one was Ted Baker. This dress would be perfect to wear to any event casual or formal, as It think it sort of falls in-between these two categories of dresses. 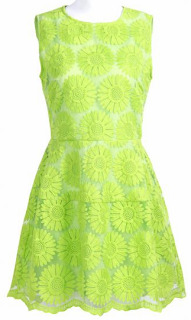 You can pick this up from ASOS, it is no longer available from Ted Baker. I thought I'd show both of these colours as they are both so awesome! The sweetheart neckline with the contrasting neon trim along the neckline and the collar makes the whole dress pop. My favourite one is the blue and the green as I am loving neon green right now! Both of these are available from Boohoo. Again with neon green! I just can't get enough of it! Midi dresses that have a peplum are my favourite style for them, this is especially good if you are not very happy with your stomach, these will make you feel more comfortable with the tightness of the dress. I would style this exactly like how Missguided have styled it here, it looks very sophisticated a goes with the dress perfectly. This dress is just beautiful, the lime green flowers -I hope count as neon- but they are just so cute! The rest of the fabric appears to be sheer which is so lovely and just makes the flowers stand out even more. You should definitely check out the dresses on SheInside, as both this dress and the first dress are my favourites and are from here. Hope you enjoyed the last part of my trilogy!